There is now an algorithm to improve online mapping of disaster areas. 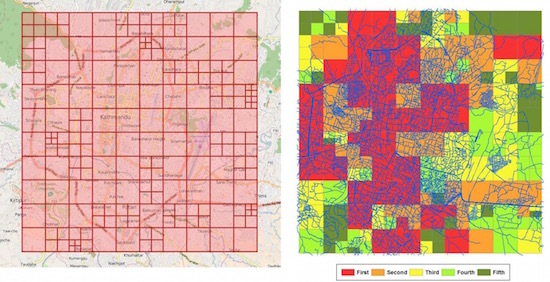 The image shows grid cells for disaster mapping (left) and cells prioritized using color codes (right). When an 8-magnitude earthquake struck Yingjie Hu’s home province of Sichuan, China, in 2008, he was more than 1,000 miles away attending college in Shanghai. While Hu wanted to help, there wasn’t much he could do because of the long distance. This has changed. That is because web-based mapping platforms have been developed that allow volunteers to participate in remote disaster response. Hu, now an assistant professor of geography at the University of Tennessee, Knoxville, and his colleagues found a way to make the process more effective by developing an algorithm that indicates which areas need detailed mapping first. With better maps of the disaster zone, response teams can respond more efficiently to the most urgent needs. In a typical web-based mapping project, volunteers review the most current remote sensing images, fill in the geographic data gaps and update the maps by, for example, indicating which roads end up blocked after the disaster. Since there can be hundreds of volunteers working together, humanitarian organizations often divide the disaster-affected area into a number of grid cells. A volunteer can then choose one cell to start the mapping task. Without any guidance on the mapping priorities, volunteers may map the grid cells in a random order. Hu and his colleagues — Krzysztof Janowicz and Helen Couclelis, both of the University of California, Santa Barbara — developed an algorithm for prioritizing the mapping tasks. Their method takes into account the area’s population, disaster severity and the road network and simulates potential rescue routes. The priorities of the grid cells then end up ranked based on how the information within each cell can potentially assist the route-planning decisions of response teams. The result of the algorithm can help inform online volunteers about the priorities of the grid cells through color codes. He added that web mapping platforms are very valuable because they allow people to participate in disaster response even if they are far away from the disaster-affected area. “Online volunteers provide up-to-date geographic information that can help disaster response teams on the ground to make more informed decisions,” he said. Right now, Hu’s algorithm only focuses on road networks.